In a period of time not so very long ago, Frenchies were a unique and unusual dog breed. This had its disadvantages, I have to admit. Potential owners would regularly make bitter complaints about how it was almost impossible to buy one for a pet. It wasn’t any easier for the potential show owner, either. I personally flew half way across North America for one of my first dogs, had my second flown from three time zones away, and flew around the world for another show prospect (in a sort of ‘Planes, Trains and Automobiles’ comedy of errors that remains memorable to this day, and worthy of an entry of its own). It’s almost as easy now to find a French Bulldog for sale as it is to find a Golden Retriever, and this rise in popularity (without any sort of drop in price) has made them a popular item for puppy mills and import re sellers – something no one could have anticipated even just ten years ago. I remember clearly being puzzled by where all of the imported Frenchies were coming from. Time and again, I’d run into new owners who were proudly showing off their European bred Frenchie puppy. Like others, I was well aware there were some excellent kennels in Europe – I just had no idea that they also had puppy mills, just as we do. Veterinary care in eastern Europe (what little there is of it) is scarcely one tenth the price of veterinary care in Canada or the US, and most of the larger, longer, rangier Frenchies being bred were free whelping and free breeding. This, and a drastically lower cost of living, made it profitable for easter European breeders to sell French Bull Dog puppies for a few hundred dollars American, as opposed to the $2500 they cost in Canada and the USA. 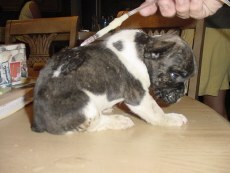 Even with the cost of shipping, the North American puppy mills quickly saw the advantages of being able to buy cheap puppies from Eastern Europe which could be re sold to gullible pet owners at inflated North American prices. A loophole in North American shipping conditions made importing even more lucrative – crates were rated by weight, not number of inhabitants, so a vari kennel rated by the airlines for a ‘twenty pound dog’ could have five 4 lb puppies crammed into it, for the same price. If one or two of them died in transit it was just considered the cost of doing business. We here in the North American French Bulldog community, while realizing that something was up, remained pretty much blissfully unaware of just how bad things were, and just how prevalent the reselling of import puppies was until the pet buyers started showing up on the lists. Stories of broken hearts, sick dogs, dead puppies and lies told by sellers were heard more and more often. The recurring theme? Few of these new owners realized that their tiny 8 week old (or less!) puppy had been bred, not in a ‘caring breeder’s’ home in North America, but in eastern Europe. The resellers, realizing quickly that puppy buyers were put off by the thought of tiny, helpless babies being sent on 24 hour or longer air flights, were instead marketing them as ‘home bred’. Still, the French Bulldog fancy wasn’t quite ready for what came next – they weren’t ready for the Wrong Puppy. Piglet was one of the first – the first time it really hit home for us that anyone could do something like this to a Frenchie. That anyone could be so heartless, so negligent, so cruel. You have to understand, we were naive. We had certain expectations of the kind of care that Frenchies deserved, and that we all assumed they were getting. Like a lot of other dog breeds faced with sudden and skyrocketing popularity, we just assumed it couldn’t happen to our dogs. I know that I couldn’t conceive of it – couldn’t believe that anyone would take six week old puppies and crate them, stacked almost on top of each other, denied food and water and even a clean blanket to sleep on, and shipped around the world – a trip that could take 30 hours. 30 hours. Think about that. A six week old puppy, no food, no water, no care – for 30 hours. Can you blame us if we couldn’t believe it? Could you, if you didn’t see the pictures? The stories and complaints about the re sellers started pouring in (still do, as Charlotte tells me – and how can anyone now still not know better?). That’s when we learned about Gina Price and Rebel Ridge. Gina Price’s trial started today in Tennessee. Small comfort to the literally hundreds of people who had their hearts broken by sick and dying puppies they bought from her – puppies they were told were ‘home bred’ and ‘raised underfoot’ (as opposed to ‘bought cheap and shipped far too young’, which was the reality). euthanized shortly after their new owners received them. Those words, of course, don’t really convey the reality of what it was like for the owners who spent their thousands of dollars, only to receive puppies infected with every disease under the sun. Puppies who died, or who lingered on, only to finally be put to sleep. John has been instrumental in bringing the issue of import puppies to the forefront, just recently having been in large part responsible for getting the 6 mo. age import limitation included in the recently passed Farm Bill. 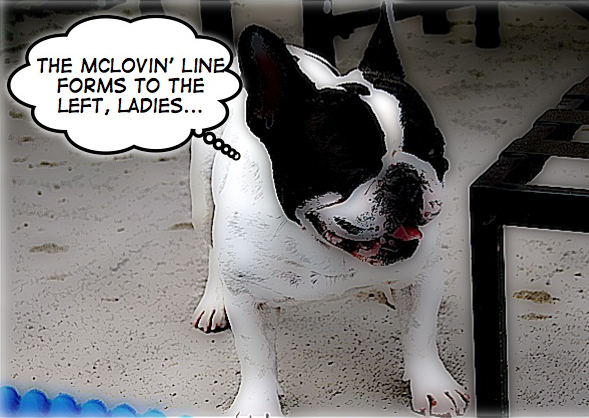 The man is tireless, and a TREMENDOUS advocate for our French Bulldog breed – and he doesn’t have one! His breed is Miniature Schnauzers. I am so very proud to know the man. I see the emails that flood in to thewrongpuppy.org website, and I cannot imagine ANYONE doing more to protect the welfare of our breed at this moment. If you’re in Tennessee, consider going out to support John and the others who’ve worked so tirelessly to bring Gina Price to justice, and to give a voice to Piglet and the countless other dogs who’ve been victimized by the import re seller trade. If you can’t come out, at least try to remember this the next time you see one of those ‘healthy imported European French Bulldog puppies’ being pimped like car parts on the on line dog sale websites. Think about what you’re supporting, when you buy from people like this. Ellie sits on the bookshelf in my living room, or part of her does, at least. She sits on the shelf where I keep some of my favorite dog books. “Animal Happiness” by Vicki Hearne, “Old Yeller” (a second edition, no less), “Nops Trials”, “Dogs in Poetry”. She is in good company there, and I can see her when I sit and read. I like being able to look up and know she’s there, unobtrusive as always and just occasionally asking you to spare her a bit of time. Ever content with what little bits of time you can spare her, that was my Ellie. We did indeed spread her ashes at Cherry Beach, setting her free on the waves, licking around the feet of silly wet puppies, brushing against the coats of diligent Goldens, barely disturbing the concentration of a frisbee mad standard Poodle. She is, perhaps, a part of them all now, part of the Lake and the sand and the plants she ran through. Part of her favorite place. I didn’t write about it before, couldn’t write about it until now. I couldn’t put down in writing “And then we spread her ashes on the water”, because as anyone knows, when it’s written it becomes true. And I wasn’t ready for it to be true yet. At the last minute, as Sean was spreading her, I told him to stop. I told him I wanted to keep part of her. He was puzzled, because I had been so adamant about letting her go free. I told him I needed part of her, that I couldn’t let all of her go. So we saved part of her, even though I know the best of her has long since floated off – across the lake, or wherever benevolent spirits like hers finally go. Part of her though, is still here at home with me, along with her memory, which I keep close at hand always.